CoQ10 is an essential molecule that assists in generating cellular energy. 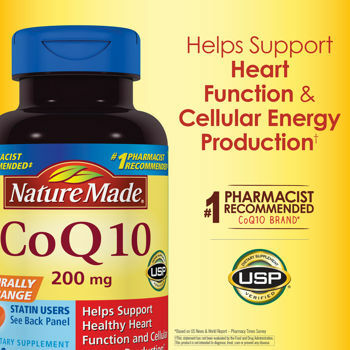 The highest concentrations of CoQ10 are found in cells of the heart, liver, kidneys and brain. Studies have shown that taking a CoQ10 supplement can help replenish the body’s decreased internal production due to age and certain medical conditions. Coenzyme Q10 (CoQ10) is found in every cell in the body and is necessary for the basic functioning of cells. CoQ10 exists inside small organelles of the cell called mitochondria, the powerhouses of the cell, where it is needed to generate energy. With CoQ10’s presence in the lining of every mitochondria, we are able to convert food energy (carbohydrates and fat) into cellular energy (ATP) and keep our body functioning at its optimal level. Knowing the role CoQ10 plays in cellular energy production, it is no wonder that the highest concentrations of CoQ10 are where we need the most energy – the heart, immune system, liver and kidneys. In the diet, CoQ10 exists in moderate amounts in meat, poultry and fish and in even smaller amounts in nuts, fruits and vegetables. Higher levels of CoQ10 can be found in organ meats like kidney, heart, and liver, while lower levels can be found paired with vitamin E in the germ of whole grains. Other Ingredients: Soybean Oil, Coenzyme Q10, Gelatin, Glycerin, Water, Soy Lecithin. No Added Color. No Artificial Flavors. No Preservatives. No Starch or Gluten.